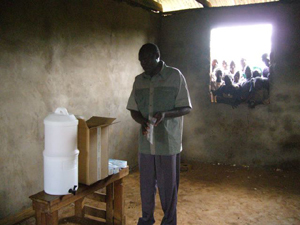 Below is a RainCatcher story, Water for everyone, that appeared on globalenvision.org, an initiative of Mercy Corps. How one individual’s simple discovery, the refreshing taste of pure rainwater, is providing solutions in the developing world. In observance of UN World Water Day on March 22, I talked with an individual who has made accessible drinking water and water conservation his life’s work. Jack Rose, the “RainCatcher” has been helping catch rainwater for use in African villages since 2004. Since that fated time, Mr. Rose has made it a habit to collect and drink rainwater in his everyday life. He invokes the image of a crazed scientist, drinking from a stainless steel cup as the rain falls. He applied this passion for rainwater collection to his career, where he designs homes in Southern California. Inspired by simple, cost-effective design ideals, Jack began drafting and modeling rainwater collection tanks for home use and landscaping. 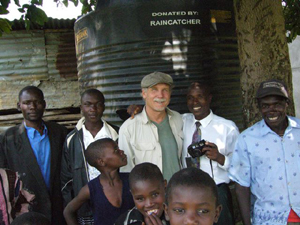 Imagine the image of a crazed scientist, drinking from a stainless steel cup as the rain falls.In 2004, Mr. Rose was invited to accompany a project called “Water for Children Africa” to Kenya, Tanzania, and South Africa. He saw the dire need for drinking water across the areas he visited and found simple solutions could create extraordinary gains. He used his experience collecting rainwater at home to set up a rudimentary system in the villages that he visited using RainCatcher tents and natural drainage areas. 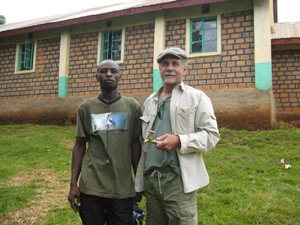 “Maji Ni Maisha”, a Swahili expression for “Water is Life” came to encapsulate Jack’s experience in Africa and reflect the dire importance of water access in many African villages. As the RainCatcher vision formed, Jack Rose began a partnership with Kenyan Fred Mango and a company called Kentainers, which produces water storage tanks for distribution in Africa. They are now installing their containers at schools across Kenya. 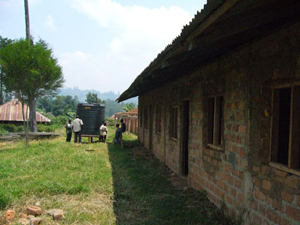 The schools provide an excellent location for the water tanks. They are generally at the center of villages and represent a source of pride for many villagers. Teachers, students and parents are the administrators of the water system once it is installed and are responsible for the security and maintenance of the container and distribution of the water. A complete system consists of a water tank, rain gutters, and a filter. Each system can be installed in one day and one truckload, carrying five tanks, can provide rain collection systems for five schools. 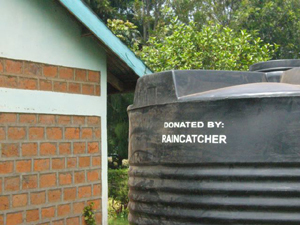 For Jack Rose, the RainCatcher methodology is a simple solution to one of the world’s most urgent problems: “there are many problems in the world that seem unsolvable … this isn’t one of them.” The materials necessary to install five villages with rainwater collection systems cost approximately $4500, including filters. The filters used are made by the Swiss Company Katadyn and cost around $250 each. The filters are an added expense; rainwater does not require filtration, but it can filter out contaminants collected from dust or rooftop surfaces. Additionally, if filters are installed in the rainwater collection devices, the system can also provide a source of clean water during the dry season. After the collected rainfall has been consumed, water from traditional sources like nearby streams and creeks can be filtered through the tank and cleaned for human consumption. Individuals like Jack Rose are the catalysts of change. He is planning several projects which will help continue his work in Africa and raise awareness about the possibilities of rain collection in both developing and developed countries. One such project is “Water for Everyone,” a film documentary which will tell theRainCatcher story and convey the power of simple solutions globally. You can read more about RainCatcher projects at RainCatcher.org. Contributed by Lindsay Benson, Project Intern at Global Envision. Lindsay has a MA in International Political Economy from American University and her research focus is in global food policy.